MM Cares in our ongoing Charity Initiative. ​In July of 2015 our world fall apart. Our 13 month old babygirl was diagnosed with highrisk Acute Lymphoblastic Leukemia. When Lauren was first diagnosed we spent 40 days in the hospital recieving multiple blood and platelet transfusions also recieving her first INTENSE round of chemotherapy. Little did we know know our journey. with cancer had just began, as Lauren had 2.5 years of chemotherapy ahead of her. Which includes 1 year of INTENSE chemotherapy. This is all still so new to us, as we are young parents just trying to start our lives. I am trying to raise money to help out with the extra costs we are now facing as we are no longer able to work while Lauren is on treatment. With Laurens immune system being suppressed, she is not able to be around many people who may be sick, even something as little as a runny nose. Extra costs are food while we are at the hospital, gas to and from the hospital for frequent and some unexpected appointments, some medications, pharmacy fees, even some bills. If you are able to help even a little bit , that would mean the world to us. Thank you for taking the time to read this. Even if you cant donate please just say a prayer for our babygirl to stay in remission! Thank you so much. On May 10th, 2017 our worlds crashed down on us for a second time. 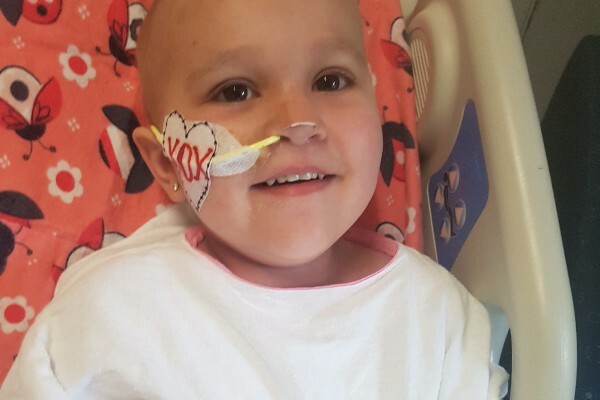 We were told that Laurens leukemia had relapsed and lauren was now going to be going through 3 cycles of even more intense chemotherapy, radiation and would be heading to sick kids hospital in Toronto for a bone marrow transplant. We couldnt believe what we were hearing. Lauren had only been in remission for 22 months and was still on active chemotherapy. Lauren is now admitted into hospital for the next 3 rounds of chemo (30 day cycles) as we need to get her cancer back into remission. After that we will be looking for a match for her bone marrow transplant. Once we find one we will be off to toronto where lauren will have 4 days of full body radiation and then will undergo a bone marrow transplant. Then we will be staying in toronto for minimum 6 months. Right now we are in Toronto sick kids hospital as Lauren had a bone marrow transplant october 12th 2017. Lauren is in very strict isolation. Our stay in Toronto is currently unknown, depends how Lauren does. It is still very early to tell! We now have extra costs with staying in Toronto. Costs like the charges to stay at the ronald mcdonald house which is $15 a day. Costs for food , parking & transportation costs & medical supplies. We still have a long road. On April 8th Laurens leukemia relapsed 5 months after her bone marrow transplant. . Laurens leukemia not only came back, but came back more aggresive this time... she now has a mass in her brain. Laurens new treatment plan is CAR T therapy. Lauren was not eligable for the trial at sick kids in toronto. So our family will be heading to Philadelphia in the USA for CAR T therapy. In the next couple weeks we will be heading to sick kids for harvesting of her T Cells and then off to Philadelphia for a consulation. About 4 weeks after that we will head back to Philadelphia where we will stay 6 weeks minimum. We have a lot of unexpected costs coming up. Flights, hotels, medications, passports, food, taxis, accomadations etc.... which alot of our costs are required upfront! Again, thank you so much for all your donations. thank you for taking the time to read this. & even if you cant donate, please keep Lauren in your prayers. Thank you sooo much !